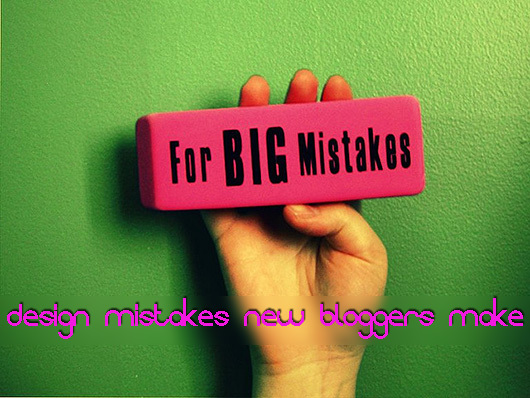 Here are 5 Design Mistakes New Bloggers Make. Although publishing great content is perhaps the most important aspect of maintaining a good blog, take a look at some of the most popular blogs out there and you’ll see that these top blogs also have an intuitive and seamless design that enhances the readers’ experiences. Unfortunately, many new bloggers don’t quite get that it’s very important to have a clean, crisp design to go with their great content. They often get caught up in the many templates they can implement, as well as the numerous widgets and other tools that many blogging platforms now feature. As a result, new bloggers tend to make a few mistakes when they first start out. Fortunately, we can learn from these mistakes; here are a few to be mindful of as you continue blogging. If you can think of some others, please drop them in the comments section for us. The first impression a reader will get of you and your blog will come from the landing page, which, in many cases, is simple the homepage of your blog. However, many new bloggers often clutter their homepages with flash animations, moving .gif images, and other features that they believe attract reader’s attention, when in fact, they simply distract reader’s attention. One or two interesting features are enough. Keep the rest of your blog crisp and clean. Second, new bloggers tend to use layouts that are awkward and actually obscure the great content instead of complementing it. For example, if you are maintaining a photo blog, you don’t want to use a three column text layout to showcase your daily photographs. But, if you’re running a group blog that covers industry news, then you might need that three column layout in order to get more news articles on your home page. In other words, you should pick the layout that best highlights your content. Another mistake new bloggers make is they often fail to account for their readers’ abilities to access the many parts of their website. Some make it hard, in fact, for readers to navigate their site easily. For example, if you run a parenting blog, that revolving cloud of parenting categories might look neat, but will your target audience of busy parents really want to deal with that interface, especially if they have a screaming kid in their lap? Probably not. Likewise, a design related blog might use such a feature to showcase its owner’s design sensibility. In that case, an audience of likeminded designers and potential clients might appreciate that form of accessibility. This is one of the biggest problems out there among new bloggers who are simply looking to monetize their blogs. It’s a big turnoff to many readers if they can hardly separate the ads from the content. Be very picky in the placement of your ads and the kind of ads you host. Finally, I see many new bloggers either fail to take advantage to search engine optimization techniques or they overuse these techniques. New bloggers should look up smart SEO techniques and implement them in a tasteful way. It’s one thing to smartly incorporate a keyword into a blog post’s title, and it’s another thing entirely to jam that keyword into a short post excessively so that the design of the blog looks terrible. If you’re unfamiliar with SEO, take a day or two to do some research online so that you can a solid understanding of what it really means and how it could work on your blog. How Much Time Do You Spend Looking at Your Website's Analytical Data?